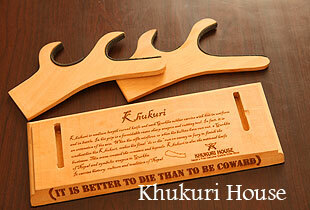 New display stand for your Gurkha blade just found at Khukuri House. Beautifully engraved Flindersia Xanthoxla (Latin name) wood with general history about the khukuri blade engraved on the wood. Gurkha Motto too at the bottom of the stand. A good piece of wood to buy if your Khukuri blade is lying some where.